Food Processing: How Good or Bad is It? Which of the following are processed foods? The answer, of course, is… (d). Are you surprised? I have to admit I was. Fast food, frozen dinners and hot dogs are obvious enough, but fresh produce and shelled nuts…really? To better understand what is meant by ‘processed foods,’ let’s figure out how they’re defined. Unprocessed foods are found in their most natural form, such as growing on a bush, tree, vine or in the ground. Picking a blueberry right off the plant and eating it is an example of this category; there are no extra steps taken between the picking and eating of the original blueberry. Minimally processed foods are unprocessed foods taken to the next logical step. This includes cleaning and removing inedible portions, refrigerating or freezing, pasteurizing or fermenting, pre-cooking or drying, and bottling or packaging. 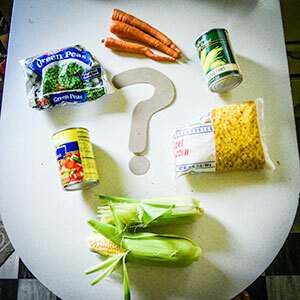 The pop quiz answers (a) and (b) fit into this category as do frozen and canned vegetables and fruits; milk; intact whole grains such as barley, oats and cracked wheat; dried beans; and shelled nuts. Raw meats are also group 1 foods. Substances extracted from whole foods are things like oils, flours, sweeteners, starches and fats. These items have been removed from a food because of their usefulness in these modified forms. They are not typically eaten by themselves and are most often used as ingredients. You may not even recognize their name on an ingredient list (modified starch for example can come from many different carbohydrate whole foods). Ultra-processed foods are what many of us usually think of when we hear the phrase ‘processed foods.’ Cookies, ice cream, soda, frozen dinners, hot dogs and sugary breakfast cereals are but a few of the products that make up group 3 foods. Here’s something to think about: these foods are often made of group 2 foods and prepared to look like group 1 foods. For example, instead of pieces of actual fruit there are gummy fruit snacks, and rather than a chicken leg there are drumstick-shaped chicken nuggets. Ironic, isn’t it? Now that we’re talking the same language, let’s dig a little deeper into the subject. As is the case with most things in life, it is important to look at all sides of an issue. To help simplify this complex topic, I’ll keep the focus on fruits and vegetables. Now, let’s consider weighing the balance of how processing impacts food, for both the good and the bad. How bad are processed foods? It’s a fact that fresh foods, if picked when perfectly ripe and stored under the best possible conditions for a very short time, offer optimal nutrition.5 They are rich in both required nutrients and beneficial plant chemicals, or phytochemicals. Unfortunately, most fresh foods that you find at a local grocery store are often picked before they are ripe and as much as weeks before you see them at the market. So they may be lower in these even though they are considered fresh. A good alternative might be frozen or canned fruits and vegetables are great alternatives, as they have undergone the least amount of processing.1 Like our banana example above, these foods may contain more vitamins than their fresh counterparts because they have been allowed to mature. Ultra- processed foods need to be looked at more closely. While they may not be inherently unhealthy, some have high amounts of calories, sugar, sodium and/or fat and contain little dietary fiber.3 It is perhaps the poor ratio of beneficial nutrients to calories, sodium, fat and simple sugars rather than the amount of processing that make group 3 foods a less desirable choice for consumers. And, so they are also good? One of the most important benefits of food processing is that it helps decrease food spoilage.3 and that can actually maintain both nutrients and food quality. Canning, freezing and pickling allows us to safely eat foods at a later date. Have you ever bought too many bananas and had them ripen faster than you could eat them? Instead of throwing them away, you can put them (peeled) in a plastic zipper bag in the freezer to be used in smoothies, banana bread or as an oil substitute in cakes or cookies sometime in the future. You are also preserving the bananas at their peak ripeness lets you to enjoy the best nutrition the fruit has to offer. As you may have noticed, the above example also helps stretch your food budget by avoiding waste. Other types of processing, especially in the case of frozen and canned fruits and vegetables, can decrease food costs because there is little inedible waste that needs to be removed. In other words, you get more useable product for your money, considering that you pay by the weight of the whole untrimmed product. Additionally, the increased shelf life canning and freezing offer increases the availability of foods that may not be in season or aren’t grown in your local region. Sometimes canning adds extra sodium to our foods, but in the balance over an entire diet, using some minimally processed foods allows you to eat healthy and save money. For processed foods that are derived from whole foods (Group 2 processed), they are actually made up of safe ingredients that are not unhealthy. Adding a lot of extra sugar to any food, adds to the calories and should be kept in balance. But, for fruits and vegetables, the alternative of using frozen and canned foods tips the balance for the good. You can get more food for the money, and it lasts longer. Monterio CA, Levy RB, Claro RM, Ribeiro de Castro IR, and Cannon G. A new classification of foods based on the extent and purpose of their processing. Cad.SaúdePública, Rio de Janeiro. 2010:26(11);2039-2049. Monterio CA. Nutrition and Health: The issue is not food nor nutrients so much as processing. Invited commentary. Public Health Nutrition. 2009:12(5);729-731. Johns Hopkins University, Bloomburg School of Public Health. Teaching the Food System: Lesson Plan 5 Food Processing. Center for Nutrition Policy and Promotion, U.S. Department of Agriculture. 2010 Dietary Guidelines for Americans. I graduated from Oregon State in 2012 with a degree in nutrition science and dietetics. Currently, I'm completing the OSU Dietetic Internship and plan to take the Registered Dietitian exam in the summer of 2013. In my free time (free time?? ha, ha) I like to garden and process (can, pressure cook) the extra harvest to enjoy throughout the year. Check out the more recent studies conducted by our research team from Brazil and elsewhere, entering “ultra-processed” as key words in PubMed…studies on Brazil, Canada and UK, and more.. I think there is agreement, Tracy does not sound like she is advocating for consumption of ultra-processed foods beyond very occasional use. It’s scary to think about just how processed foods are and how they affect our health. It’s a domino effect. Thank you for addressing this. The lines between whole foods and processed foods are fuzzy in most people’s perception and trying to communicate clearly on this topic can be challenging! I appreciate that you factored in commonsense values such as avoiding waste and saving money. Visit the Moore Family Center website to see how we take a multidisciplinary approach to understand the role of all foods in health promotion and disease prevention. The Low Carb Conundrum: What Does Research Say? All posts are written by Dietetic Interns. The Dietetic Internship at Oregon State University (OSUDI) is a non-credit, non-degree, post-baccalaureate, ACEND accredited program. Upon successful completion, graduates are eligible to take the Registered Dietitians registration exam. © 2019 Moore Family Center Food Coach, all rights reserved.